NI Replika: grab this delay without delay. Native Instruments is celebrating the holiday season in the way it knows best: by giving you a free plugin. This year's DSP present goes by the name of Replika, and is described as a high-fidelity delay effect that can produce a wide range of spatial sounds. There are three modes: Modern, Vintage Digital and Diffusion. 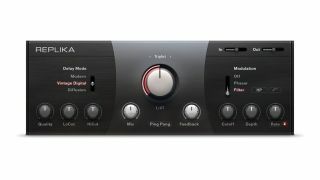 You'll also find a resonant filter and 'classic' phaser onboard, while the simple interface promises to enable easy access to the plugin's modulation options. The giveaway is for a limited time - Replika will cost £44/$49/€49 as of 1 January 2015. There are further holiday giveaways, too. NI is allowing DJs to download ten Free Remix sets (loop and one-shot sample packs) for use with its Traktor Pro 2 DJ software. These come from the likes of Pezzner, Tom Trago, Wellenrausch, My Digital Enemy, and more. Finally, you can also grab a free £22/$25/€25 e-voucher for NI's online shop, though you'll have to spend it quickly as it expires at the end of 2014. You can enter a prize draw to win a flagship NI product, too. You can take advantage of all of these offers on the Native Instruments website.